​Proofreading is the process of examining the final draft of the manuscript—after it has been edited—to ensure there are no errors. ​Content editing is primarily concerned with the content, structure, and readability of your manuscript. Copy editing is more concerned that the style, grammar, punctuation, spelling are all correct and consistent. Copy editing also ensures that the idea the writer wishes to portray is clear and easy to understand. ​Line editing focuses on the language, the words that convey your story. Awkward sentence structure can take away from the reading experience. Line editing is the final step in the editing process, not including a final proofread. This includes two rounds of changes to your manuscript: one round of editing (content, copy, line) and one round of proofreading. 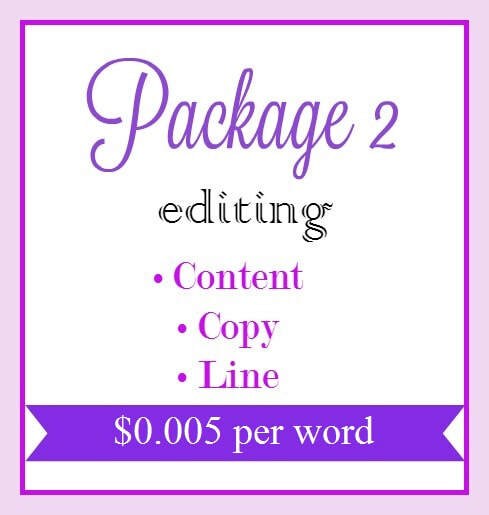 I know self-published authors are in a special position, which is why I strive to offer complete editing services at affordable and competitive rates. I work on Microsoft Word files only and use the Track Changes feature for editing and the Comments feature for suggestions or questions. No changes are made to the manuscript without your approval. I use The Chicago Manual of Style, 17th Edition—which has been the book publishing industry standard since 1906—and the Merriam-Webster Dictionary for reference. I advise authors to consider booking both the editing and proofreading services (Package 3). Editing is an in-depth review and could require rewrites. After the author has made the necessary rewrites suggested during the editing process, the manuscript should be proofread to make sure that grammar, flow, consistency are still correct, and that there are no missing or extra words left. My turnaround time is between 7 and 10 days from the day we set for editing to begin. This depends on the length of the book and how much work the book requires. Payments are made only through PayPal. Authors will receive a PayPal invoice on the day the edits are completed, before receiving the edits. All payments made by the author once the editing process is complete are non-refundable. Upon booking, a signed contract is required to hold your spot on the calendar and also for tax purposes. Date ranges are flexible as I realize writing a story cannot be forced. The author agrees to acknowledge the editing services provided by Lawrence Editing in ebook and/or printed published work on the copyright page, listing Lawrence Editing as Editor. The listing on the copyright page will contain the name Emily A. Lawrence and/or Lawrence Editing and the website: www.lawrenceediting.com. ​​The copyright, together with all publishing rights to any manuscript submitted, shall remain the property of the author. without express written consent from you.